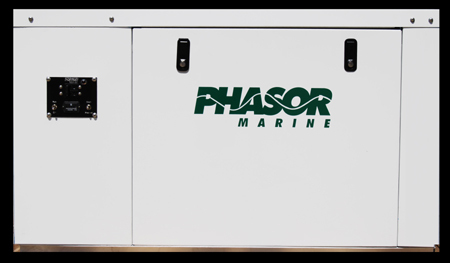 Phasor Marine's sound attenuated enclosures are constructed of light weight powder coated aluminum panels with double lead-lined foam insulation to insure the ultimate in onboard comfort. A fully removable access door with cam type positive locking latches is provided on both sides of the engine, and the heat exchanger pressure cap can be reached through a screw-out inspection plate at the top of the enclosure. Penetrations are provided for exhaust, control wiring, A.C. electrical cables and D.C. battery cables as well as fuel and oil lines. The entire sound enclosure is ventilated by a D.C. 12 volt fan mounted in the forward panel to provide a continuous positive flow of fresh air to cool the electrical end and provide combustion air to the engine.